Paul Dixon has gone through the heartbreak of relegation once and it's not something he ever wants to experience again in his career. 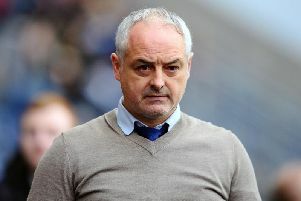 While at Dundee United, Dixon experienced the cruellest of relegations from the Premiership - with the Tangerines going down at the home to of their city rivals Dundee. "It was probably the worst feeling that I have had in my career," he told the press on Tuesday. "It's not something that I want to experience again. "It's my job as the oldest, if not one of the oldest, in the team to give my experience to the younger boys and help them through it. "There's a couple of us in the changing room who have been in this situation before, whether it's coaching staff or players, and all we can do is just try to keep everybody positive and keep heads up and working hard - like we have been. "That's all we can do and the boys have been doing it. Every game since I have been here we have been fully competitive in every game and there has been fine margins and things haven't quite gone our way. It's all positive, the way I see it." The 32-year-old believes that there is still time for the Bairns to achieve what they set out to do when he arrived at the club, as they look forward to a big derby match with Dunfermline at East End Park this Saturday. "We are fully focused on the job and we know exactly what we have to do," he added. "It's still there for us to get out what we set out for. "It's always good to play in a derby, no matter what derby it is. It's a special one-off occasion. It'll be a good game. "A team can be flying high or down low and you come to a derby day and it's almost like a fresh slate - anything can happen." On top of the Dundee derby, Dixon says his best experience of a derby was beating Leeds United while at Huddersfield Town in England. There will be a full interview with the full-back in this Thursday's Falkirk Herald.